My Handmade Crafts is where you can find high quality home accessories or gifts! There you will find a whole range of products, From cushions, to paintings, books and decorated mirrors and picture frames! All items are available, payment through Paypal. Or if you would like to supply the fabric for some cushion, Send it to me and I can make the cushions at a discounted price. 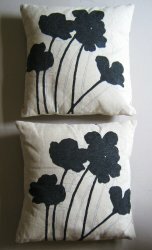 This is ideal if you would like to match your cushions with your curtains or bed linen!